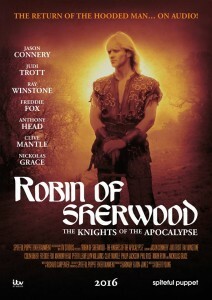 I’m delighted to be interviewing the producer of the brand new Robin of Sherwood audio production today (The Knights of the Apocalypse #KOTA) – Barnaby Eaton-Jones- today! Got your coffee and cake? Feet up for five minutes? Then let’s begin! 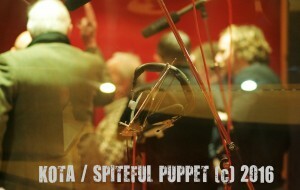 How did you get involved in #KOTA? I was asked to co-produce by Simon Barnard, of Bafflegab Productions, as I’d been organising the 30th anniversary ‘Robin Of Sherwood’ celebration – The Hooded Man 2014, which made history by being the only event to have both Hooded Men together at the same time and on stage together being interviewed; Michael Praed and Jason Connery. It was I who liaised with Richard ‘Kip’ Carpenter’s estate and suggested we use the unproduced KOTA script, as well as asking all the surviving actors from the show whether they wanted to come on board. 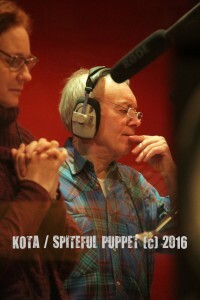 Sadly, Simon left the project in late 2015 and I become sole Producer and basically started the production again (re-casting, re-writing, booking new studios, finding a new audio company – Spiteful Puppet – and generally making sure that ITV and Kip’s estate didn’t pull the plug on it, which was very, very close to happening). It was all rather hectic but I think the production become stronger because of it. Have you always like RH/RoS? You’re much too young to have watched RoS when it aired the first time around. You flatter me! Ha. I am easily old enough to have watched it the first time round. When the show ended, I was hitting my teenage years, and so I recall it all with great clarity and loved every second of it. I think I’d always had a fascination with Robin Hood (I recall reading the ‘proper’ legend, which was anything but, that had been written by Enid Blyton – a simplified version of the most well-known tale – when I was young. But, Robin Of Sherwood was a different chalice of mead. It was rooted in the ’80s but yet seemingly tireless. It was rather ‘adult’ for a teatime adventure slot on ITV (there is talk in the first episode of Will Scarlet’s wife being raped by soldiers, hence his rather unhinged character and desire to fight the Normans). I eagerly awaited ‘Look-In’ (the TV guide for kids), that had a comic strip of the show in it and the odd article and I recall the confusion when Michael Praed’s Robin died and the next series saw the introduction of a new Hooded Man, in the form of Jason Connery’s Robert of Huntingdon. As I got older, I loved the fact that Kip had basically used the two most well-known legends for the outlaw – the first being a Saxon peasant, in the form of Robin of Loxley, and the second being a well-to-do song of an Earl, in the form of Robert of Huntingdon. Artistic leeway aside, with Kip’s interpretation featuring a regular Merry Man in the form of a Saracen called Nasir, I think his vision was pitch perfect for the show and I don’t believe there’s been one better before or since. My two little daughters will say it’s being a silly Daddy. I work from home, so I look after them. But, I basically do anything that’s creative. I’ve been a writer (documentaries on television, published book, published poet, etc), a publisher (Chinbeard Books Ltd), an actor (mostly on stage but a lot of voiceover work and the odd foray into the limelight), a director/producer (I just find projects easier to do if I sort them myself! ), a musical tart (writing and performing comedy songs, not-comedy songs and, at one time, spending nearly a decade being Elwood in a 10-piece Blues Brothers tribute I managed), an improviser (my monthly comedy show has returned after a little break, to take a year-long residency in Cheltenham at The Playhouse) and an impressario (I have run The OFFSTAGE Theatre Group since 1993 and we’ve toured here and overseas with many original and ‘classic’ productions). It all sounds highly egotistical but, in a nutshell, my life has been geared to make people happy. I love that. It’s not for me, though of course it does make me happy too, but knowing an audience is having a good time – in comedy or in drama or in music – really fuels me. So, I try not to have an ego. If I do, I certainly keep it in my back pocket. Have you always been a ‘creative’ type? Yes. See above. Ahem. At school, I was known for writing ‘too long stories’ (can stories be ‘too long’? I don’t think so). Often being given a subject and ending up finishing my exercise book and asking for a new one to end it in, as well as illustrating them too. I think that began as early as Infant School, as did my love of standing up and making people laugh. I was probably about 4 or 5 when I was cast as Grumpy in the school play and I only had one line – “I am Grumpy!” – but I still recall the roar of laughter when I said it and the feeling that I wanted to do that again and again. What’s next for you after #KOTA has aired? I’m currently putting together a tour for the revival of an old BBC Radio comedy series called ‘I’m Sorry I’ll Read That Again’ (which starred John Cleese, Graeme Garden, Bill Oddie, Tim Brooke-Taylor, et all). 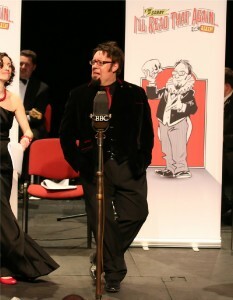 We did a one-off version for charity, to see how it faired and it seemed to work well and attract a big audience. So, we’ve been kindly granted a longer licence by Graeme and Bill to tour with it. Plus, I’ve finally got time to get my publishing company back on track a bit. We’ve got a lot of books finished and ready to be released but I just haven’t had the time. Of course, I also need to be beaten up by my little daughters and make them laugh by falling over a lot. 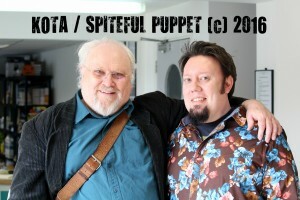 Many thanks for such a great interview Barnaby- and for the exclusive photographs! I know you are extremely busy getting the #KOTA production ready in time for next months premiere!